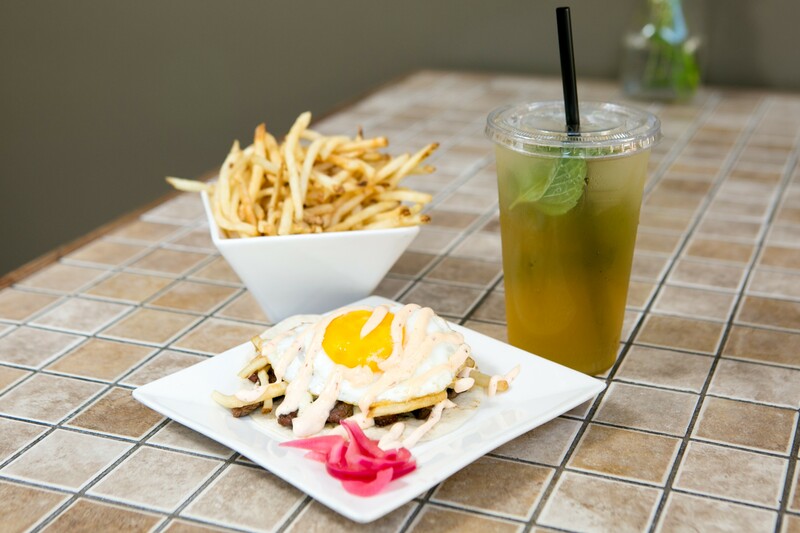 Steak & eggs taco, fries, and iced tea at Belly. Prix-fixe bargain hunters, take note: The sixth annual Oakland Restaurant Week kicks off on Thursday, January 14 and will run through Sunday, January 24, with approximately 100 restaurants running special deals during the promotional period — $20, $30, $40, and $50 prix-fixe menus that will be offered during lunch or dinner. 1. One of the best bargains comes courtesy of the Korean-fusion taco joint Belly (1901 San Pablo Ave.), where the $20 dinner prix-fixe is meant to serve two people. The deal comes with four tacos (roughly a $16 value all by themselves), plus an order of fries (the garlicky mojito fries would run you another $6), and two house-made nectars to drink. 2. Juhu Beach Club (5179 Telegraph Ave.) is offering a doozy of a $20 dinner prix-fixe, which comes with a bhel (puffed rice) salad, a choice of two curry entrées, and a Linden Street Brewery draft beer. The curryleaf coriander shrimp curry alone normally costs $23 — so, when all is said and done, diners who choose that option will wind up getting their meal for half-price. The margherita pizza at Forge. 3. 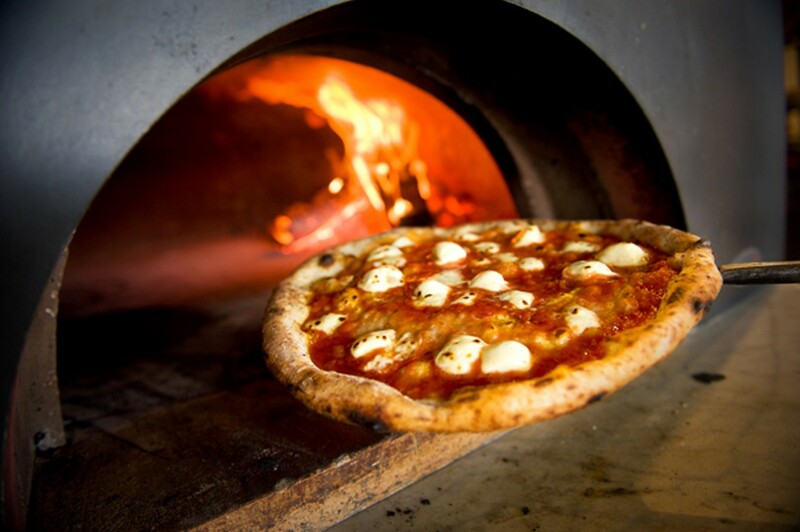 Forge (66 Franklin St.), the Jack London Square pizza restaurant, is offering a $20 lunch or dinner deal that includes a margherita pizza, arugula salad, and house cocktail — all told, a $34 value. 4. In a similar pizza-centric vein, The Star on Grand (3425 Grand Ave.) is offering a $20 lunch prix-fixe that’s meant to serve two: a small pizza and a salad of your choice, plus a slice of cheesecake. A small deep-dish pizza — definitely hefty enough to feed two hungry lunch eaters — will normally cost you $20 by itself, so everything else is gravy. 5. Restaurant Week is a great time to check out Salsipuedes (4201 Market St.), one of Oakland’s most interesting — albeit somewhat pricey normally — new restaurants. What I love about the $30 three-course prix-fixe dinner menu is that diners are allowed to choose from a wide swath of the restaurant’s regular offerings — six different options for the first course, and four for the second course, plus dessert and an agua fresca (a $5 value) to drink. If you choose the most expensive option in each category (and why, dear bargain hunter, would you not?) and order the black cod tiradito ($18) and the pork steak ($21), you wind up with a $44 value, plus however much the Oaxacan chocolate pot de crème (not listed on the restaurant website) would normally cost. That, my friends, is a deal. 6. Finally, the waterfront Italian restaurant Lungomare (1 Broadway) is the ideal Restaurant Week option for the cheap but elegant drunk. The $30 three-course dinner — which, if I were to order, might include Mulefoot pork belly topped with a runny-yolked quail egg, smoked beef brisket over polenta, and Meyer lemon cheesecake — is already a pretty good deal on its own. But the kicker is that the prix-fixe also comes with an endlessly refillable glass of red or white wine, all but guaranteeing that you’ll get your money’s worth, and perhaps more than you bargained for. Oakland Restaurant Week festivities get underway with a kickoff party at Swan’s Market (510 9th St., Oakland) on Wednesday, January 13, 5–7 p.m. The $25 ticket comes with a bite from each of the eight participating restaurants located inside the market, plus a drink. Meanwhile, Berkeley will kick off its own Restaurant Week one week later, Jan. 21–31, with 23 participating restaurants offering $20 prix-fixe lunch menus and/or $25 or $35 prix-fixe dinner menus. Specific menu details are available here.